Senior EU officials will visit Zimbabwe this weekend to push for progress that could deliver a normalisation of ties. 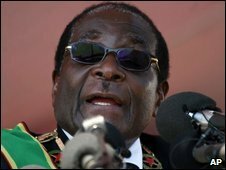 It will be the first such visit since the EU imposed sanctions targeting Zimbabwe's President Robert Mugabe and his top aides in 2002. This week southern African leaders urged the international community to lift sanctions against Zimbabwe, now that it has a power-sharing government. But senior EU officials say there is no plan to lift sanctions. They say it is just a preparatory visit, to re-establish a political dialogue. The EU acknowledges that significant progress has been made, but it is mindful that President Mugabe has still not fulfilled all his promises to end harassment of the opposition, and to respect human rights, the BBC's Peter Nettleship reports. Swedish Prime Minister Fredrik Reinfeldt, whose country currently holds the EU presidency, said the EU was not considering lifting sanctions. "It is not the restrictions that are creating problems in Zimbabwe, it is the mismanagement [and] not respecting of human rights," the AFP news agency reported him as saying. Swedish Development Minister Gunilla Carlsson and EU Aid and Development Commissioner Karel de Gucht will hold talks with President Mugabe, Prime Minister Morgan Tsvangirai and other senior officials. Long-time opposition leader Mr Tsvangirai wants a removal of sanctions to be conditional on how well the power-sharing deal signed a year ago has been implemented. But this week the leaders of the Southern African Development Community (Sadc) rejected that proposal. South African President Jacob Zuma, who has criticised Mr Mugabe in the past and was expected to side with Mr Tsvangirai, said there should be no conditions placed on the removal of sanctions.